A Connecticut radiology group uses computer-aided detection to improve diagnosis and efficiency. For Pupinder Jaswal, MD, using computer-aided detection (CAD) with breast MRI provides an important differentiator when it comes to diagnosing breast cancer, particularly in women with dense breast tissue. While MRI offers high sensitivity, CAD software helps Jaswal and his associates characterize lesions of concern and reduce the number of false-positives. Jaswal, a breast imaging/biopsy specialist at Radiology Associates of Hartford in Connecticut, began using iCAD’s SpectraLook advanced image analysis CAD solution when it was installed last fall at one of the group’s three community-based imaging facilities. Radiology Associates is a network of community-based radiology practices, started in 1976, and is comprised of 20 physicians and two physician assistants. The network includes imaging facilities serving the residents of Avon, Enfield, and Glastonbury. SpectraLook provides radiologists with diagnostic information by creating colorized images based on direct signal changes due to influx and efflux rates of a contrast agent through suspicious lesions. Differences in the enhancement and washout rates reflect differences in lesion physiology. The software provides quantitative information about the breast tissue and creates colorized images that show areas of suspicion. The CAD software is designed to assist radiologists by highlighting potential breast cancers as part of their overall analysis of the MRI procedure results. SpectraLook’s pharmacokinetic model assesses changes in signal intensity to calculate the numerical values of key physiological parameters, allowing clinicians to discern biological processes taking place in malignant vs. benign tumors. Cancerous lesions “light up” with CAD in a way that makes them easier to detect, with the rate at which an artifact is enhanced determining what the lesion is, Jaswal says. That’s where the false-positive issue surfaces as radiologists work to examine the numerous points of interest that can be uncovered with an MRI scan. 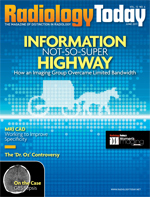 CAD is being used to bring specificity to the sensitivity of MRI technology. SpectraLook comes with customizable configuration settings that help ensure consistency across magnets and contrast agents. In addition, the software’s postprocessing image analysis algorithm uses all available time points. With this feature, changes in the image brightness of voxels over time are converted to changes in contrast concentration, and lesion parameters provide quantitative representation of physiological processes at the cellular level. Jaswal reports “good success” with SpectraLook to date. He notes that iCAD’s software offers more in-depth color coding, which helps with lesion identification. It also has the capability to determine whether there is additional suspicious activity in the breast, with blood vessels acting as a map and flowing to an area of possible interest. Using CAD can also help during an MRI biopsy, Jaswal adds. The clinician conducting the biopsy doesn’t have to go back and forth between images to see where the lesion is located; the doctor can simply print a 3D map showing where the lesions are located and use that as a guide. “Viewing breast MRIs with SpectraLook gives us more functional images, and we can process them in less time,” Jaswal says. The standard breast MRI process usually takes several hours, with time allotted for reviewing each lesion found during the study, according to Jaswal. With CAD, he says the completed exam can take as little as 25 minutes. “With turnaround time like this, you can have results in the same day as the exam was done,” he says. Adding to the software’s efficiency is its Web access feature, Jaswal notes. Radiologists and other physicians can access CAD information securely online from a Radiology Associates server, enabling them to read results from their offices or even from home. Including CAD with breast MRI for cancer screening is a continually developing addition to the push toward the earlier detection of breast cancer. CAD for MRI was first developed to assist radiologists with the processing and reporting related to breast MRI studies. With the large number of images generated by MRI, CAD helps screeners focus on areas of greatest concern. And CAD has evolved, according to Constance Lehman, MD, PhD, a professor of radiology at the University of Washington and former chair of the ACR Breast MRI Accreditation Committee, because it now goes beyond the assessment of lesions. Lehman, who is also director of imaging at the Seattle Cancer Care Alliance, says CAD has become more user friendly over the years. However, radiologists should still undergo training to learn how to use it and how to interpret breast MRI, particularly when it comes to reading images. For example, if a patient is moved during an exam, the computer doesn’t know that, and images can reflect the movement in ways the reader doesn’t expect. “The movement could cause some artifacts that might be a problem for the software to read,” she says. Lehman discusses a recent study highlighting the effects of introducing new technology and the training that goes along with doing so. The study looked at imaging situations involving both novices and experts with and without CAD. The best interpretations occurred with experts using CAD; the worst interpretations came from novices using CAD. Lehman expresses concern that radiologists will become overly dependent on software programs such as CAD, possibly putting new technology ahead of basic radiology screening techniques. Jaswal says Radiology Associates currently uses SpectraLook software on two computers. Technicians receive training on how to obtain the data and properly feed the information into the software. In addition, training for radiologists on how to read the images is provided by iCAD. Jaswal notes that breast MRI in itself was just being considered five to six years ago. At that time, he says, radiologists were using an original mode with only five sequences. With MRI, lesions displayed themselves easily, but visual perception was subjective. As CAD products started hitting the market for use with breast MRI, Jaswal says he started seeing progress toward gaining a better perspective on whether a lesion was cancerous or benign. In the beginning, however, he notes that CAD products were not as comprehensive as they are today. Some of the improvement with CAD use may have been driven by the American Cancer Society’s (ACS) 2007 guidelines recommending MRI screening along with a yearly mammogram for women with a high risk of developing breast cancer. With this, CAD has started to play an even more important role in breast cancer detection. Lehman notes that the ACS recommendation was an important step in diagnosing breast cancer in women at high risk. However, she points out that it’s just as important to make sure high-quality MRI is available to those women.